Cheers! Recently I have been humbled as well as extremely honored to have been named into a few different community programs that recognize folks for being active within the IT Community. My absolute favorite part about the community is connecting and sharing knowledge with IT Geeks who share the same passion for IT ‘stuff’ as I do. 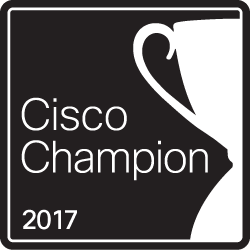 The Cisco Champion program awards IT Pro community influencers for their activity and engagement around the greater Cisco ecosystem. The purpose and mission statement of the Cisco Champion Program is to create and have supportive network of people who are passionate about Cisco and enjoy sharing their knowledge, expertise, and thoughts across the social web and with Cisco. One of the coolest parts of the Cisco Champion program is the fact that it encompasses different areas of interest and different types of technologies within the IT stack. There are automation experts, CCIE type experts on routing and switching, voice and collaboration professionals and there are the infrastructure focused that do UCS deployments. The benefit is having a community of these experts that share same passion as I – sharing knowledge! The community has been and will continue to be a huge focus in my personal and professional career. I am very happy to be a part and contribute to all of the programs that I am a member of! Congrats! I wasn’t aware that the new MODE program was available. I’m assuming there will be other Microsoft expert programs that are similar to this one becoming available, if not already available. MODE is brand new and I do like the concept of sub-communities that are focused on individual areas of technology. We’re seeing that more and more frequently with VMware (NSX, VSAN) and now with Microsoft too.